Brimming with ample space, Marguery Villa Prestige offers luxurious accommodation in the sunny district of Black River. This two-story building is perfect for large groups and families and can very comfortably sleep up to eight guests. 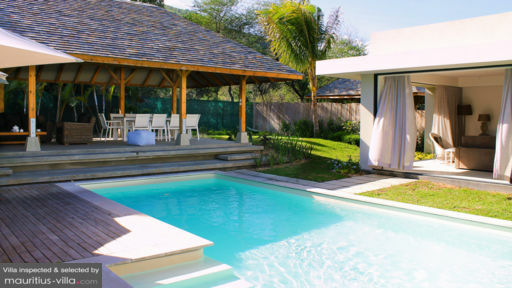 Boasting typical Mauritian architecture, Marguery Villa Prestige is also known for its comfortable furniture as well as its wide range of facilities and services offered to visitors. Marguery Villa Prestige has four detached bathrooms that can sleep up to eight people. In the master bedroom, you’ll find a private safe, flat-screen television as well as a double bed and an en-suite bathroom with bathtub, walk-in-shower, toilet, double basin and hairdryers. As for the guest rooms, they come with twin beds that can be converted into double beds upon request. The guest bathroom comes with a shower and a hair dryer. 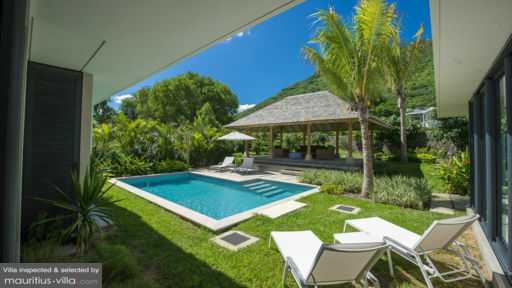 At Marguery Villa Prestige, guests will be able to enjoy a highly relaxing time in the green manicured garden. Featuring plenty of shrubs and trees to protect you from the island sun, the garden also contains sun beds upon which you can lounge back and relax with your favorite drink and book as you work on your tan. With a pool deck, the garden also homes a pool deck upon which you can enjoy balmy evenings out with your friends and family. In the villa, you’ll also find a balcony as well as an entry porch where you can enjoy quiet evenings in during your holiday in Mauritius. In Marguery Villa Prestige, guests will be able to enjoy a total interior area of 194 meter square. Decked up in a light and airy décor, the living room offers extremely comfortable furniture as well as a flat-screen television with satellite. Overlooking the garden, the living room also paves the way to an open-plan dining room that can seat up to eight people. More importantly, guests of Marguery Villa Prestige can make full use of the fully-equipped kitchenette that comes with just about anything you will need to prepare your meals in the comfort of your villa. Indeed, the kitchen comes with various types of small appliances, including coffee maker, fridge, induction hob, microwave oven as well as a plethora of utensils. There’s no denying the exceptional level of service offered to you at Marguery Villa Prestige. For example, a concierge service can be found in the complex, where you will be provided with local insights on weekly events including sports, concerts and the likes. 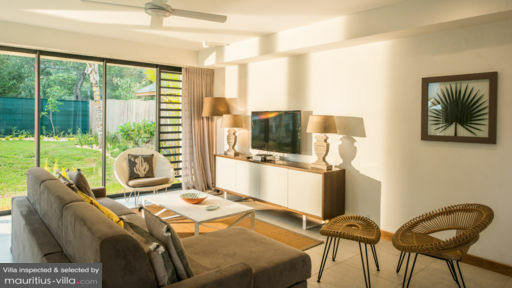 More importantly, guests of the villa will be able to benefit from the services of a daily housekeeper who will take care of tedious issues in the villa while you focus on benefiting the most from your vacation. Additionally, a gardener will be there to tend to the plants and keep your garden in perfect condition. Guests of the villa can also enjoy an exclusive access to The Club House where you can book several sea activities and cruises. Not far from the villa is Ruisseau Creole, a highly popular and varied shopping mall that caters to different budgets. If you want to work on your swing while you’re holidaying in Mauritius, you can always head over to the Tamarina Golf Course which is just a few minutes away.